SPIN JET® rotating nozzles, producing a cleaner surface than grit blasting. You'll also eliminate the cost and hazards of grit, and simplify your clean-up and disposal. NLB's ultra-high pressure pump units produce up to 40,000 p;i (2,800 bar). 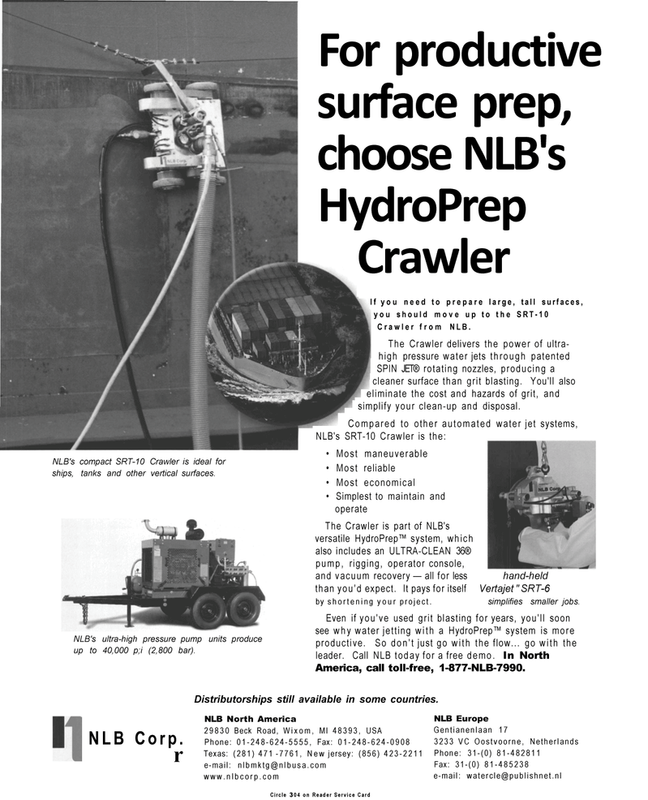 The Crawler is part of NLB's versatile HydroPrep™ system, which also includes an ULTRA-CLEAN 36® pump, rigging, operator console, and vacuum recovery — all for less hand-held than you'd expect. It pays for itself Vertajet " SRT-6 by shortening your project. simplifies smaller jobs. Distributorships still available in some countries. automated water jet systems NLB North America NLB Corp.